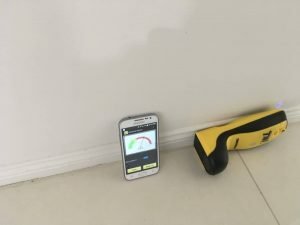 During the building and pest inspection i picked up some moisture readings using the Termatrac t3i in one of the bedroom walls. This area i marked for further investigation. As it is not normal to find moisture readings in a internal bedroom wall. Moisture found in walls either indicates a ventilation problem or maybe a leaking roof. But this will ring alarm bells to termite inspectors as it could be termites. Termites need moisture and have a high moisture content in their termite leads. This moisture will show up on the moisture meter we use during the inspection process. So after i had finished the inspection i went back to the room with the high moisture and used the radar part of the termatrac to see if there was any movement. The termatrac was placed against the wall and it started to pick up movement. We can tell almost immediately it was termites as they have their own unique movement signature on the termatrac. 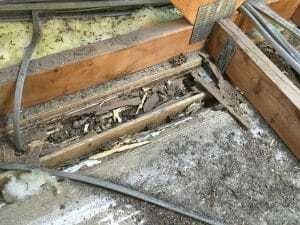 Once this happens we offer to do a more invasive inspection to determine the extent of the termite damage. The purchaser either does this or pulls out of the contract. The cost of the invasive inspection is the purchaser's responsibility which also includes the repair of the holes which is generally minor. In this case the purchaser pulled out of the sale as wasn't willing to take the risk with this property. Here we have the termatrac picking up termite movement in a wall. Also we checked the roof void and found a substantial amount of damage to the top plates so the cost of repair to the house will be in the tens of thousands of dollars. The owner informed us that he had an inspection the previous year and they found no issues . So this damage was either caused in the 12 months since the last inspection or it was missed. The house has had the termites treated with termidor foam and we are installing a termite barrier with the latest termidor. TERMIDOR H.E. spreads much further through the soil than older treatments to create a more even and effective protective zone termites cannot avoid.